We saw a preview for the new movie, "Winnie the Pooh" when we went to see "Cars 2" (which by the way was an awesome movie! Bella LOVED it!) Bella doesn't know too much about Winnie the Pooh and asked about him after the movie. We'll definitely be taking her to see it next month when it hits theaters! 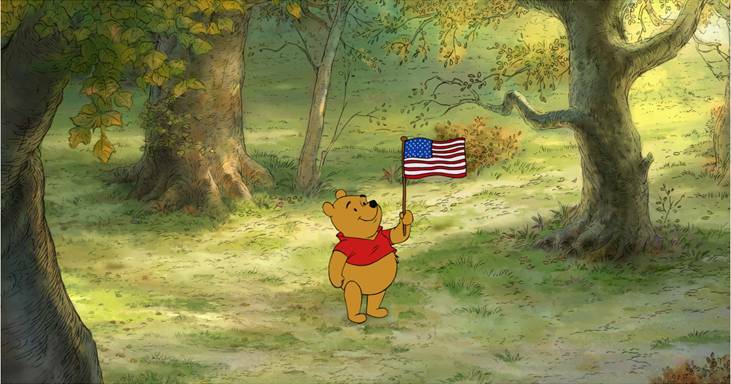 An Independence Day Image of our favorite Silly Old Bear! Disclaimer: I am a Walt Disney Insider in association with Dreamworks Studio. I was not compensated to write a positive or favorable review. All opinions expressed are that of My Munoz Family. Okay, I admit, after I saw the preview on TV, even I want to go see this!